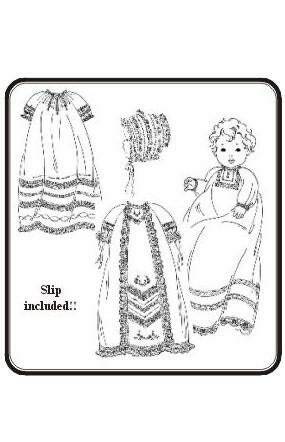 Three beautiful Raglan style Christening Gowns. Each is the traditional 27" length. Choose from Front Lace Panal Gown, Tucked and Gathered Yoke Gown or Tailored Gown. Three sleeve styles to choose from. Long tucked sleeve, long sleeve with beading or 3/4 length embelished sleeve. Slip and bonnet included. All are wonderful for Boy or Girl Baby. Available Sizes: Infant to 18 lbs. I ship within 1-2 business days using USPS 1st class shipping whenever possible. When I find that the shipping charged was higher than necessary I will refund the overage. Needles are shipped in a heavy cardboard envelope to prevent bending. While this would seem to increase the shipping cost actually USPS charges the same rate for 1, 2 and 3 oz. 1 oz is the smallest weight I can use. Based on this I have set a flat shipping rate of $3.00 for up to 80 pleater needles shipped in 1 package within the United States. I am happy to ship Internationally but must calculate the shipping. Please request a custom order so I can add the appropriate postage for your country. Damaged items can always be returned. Cut fabric can not be returned or cancelled. Non fabric sales can be canceled but if the shipping label has been printed the shipping cost will not be refunded. When items are returned the postage will be paid by the buyer. Refund will be for the cost of the item only. Can fabric purchases be cancelled or returned? No. Fabric purchases can not be cancelled or returned. How do I order more than 1 yard of fabric? For even yards specify the amount in the quantity field. For fabric amounts not listed or not a multiple of 1 yard , for example 1 ½ yards, please enter a custom request and I will gladly cut it for you.